The All-in-One controller is available in two series: UniStream 5" and UniStream 5" Pro. Both series support SNMP, VNC, FTP, SMS, email, and communications via GSM/GPRS modem. The Pro version also offers a built-in Webserver, audio jack, and video support, as well as SQL, a plus for system integrators and OEMs facing Industry 4.0. 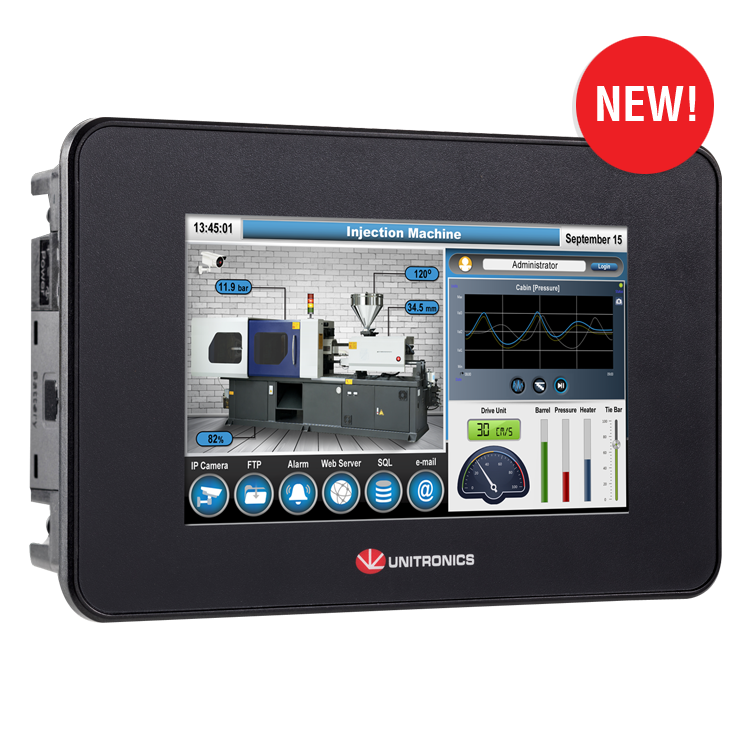 UniStream 5", with its resistive colour touch-screen reduces space and wiring requirements, and eliminates the need to set up Panel-PLC communication. Built-in I/O configurations vary according to model, offering digital, analogue, high-speed and temperature I/Os. Users can expand the configuration up to 2,048 I/O points. Built-in COM ports include Ethernet, 1 USB host and 1 Mini-B USB device ports; additional add-on ports for serial and CANbus are available. The rich feature range of UniStream includes auto-tuned PID, data logging, data tables and Recipes, data sampling displayed via built-in Trends and Gauges, Alarms, multi-level passwords, and plug & play communications for CANopen, CAN Layer2, MODBUS, EtherNet/IP, and more. A Re-Use paradigm enables the programmer to build Ladder and C functions, design HMI screens, and create Web pages in multiple languages including Asian languages—then save it all in a Library to reuse in other projects.